UDF’s student wing, UDSF took out a bike rally in Kalpetta,today. 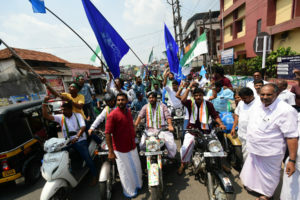 It was part of UDF election campaign to ensure Congress president Rahul Gandhi’s record win in Wayanad Loksabha constituency. 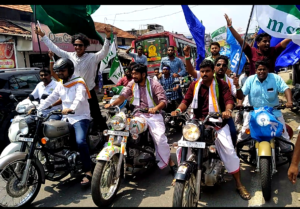 The rally began from Sulthan Bathery and passed through the national highway,covering major points and culminated at Bathery..
Around 500 youth volunteers joined in the bike rally, said Ad.K.P.Anil Kumar,UDF Media-in-Charge,Wayanad Mandalam,Wayanad- 2019 MSF state president TP Ashraf Ali inaugurated the rally. Former M.L.A and Congress leader M.D Appachan and UDF district leaders received the riders with garlands and shawls at Kalpetta town. Valedictory meeting was inaugurated by NSU national president Neeraj Kundan. KSU state president K.M.Abhijith,KSU state Vice President Jasheer Pallivayal,state president Amal Joy,MSF state Vice President C.Abdul Rasheed,state secretary Muneer,KSU state general secretary Mathew K John,Lionel Matheew,MSF state council member PP Shaijal led the bike rally. This News was posted on Saturday, April 13th, 2019 at 1:59 pm and is filed under City Talk.